Ale to the 'Burbs is a monthly collaborative beer blog series. Five Chicagoland beer blogs...five communities...five suburban beer destinations...all on one day. From the hidden neighborhood gems to the well-known pillars of suburban craft beer, we've got the Chicago 'burbs covered. Links to the other four articles are listed at the bottom of this post. Check back next month for another set of articles. St. Charles, like many Chicago suburbs, isn't particularly known as a craft beer town. The town has no brewery (yet), and at least on first glance, the bar scene downtown along North Avenue seems a fairly typical mix of sports bars and Irish-style pubs. But turn south and head one block down Riverside Drive and you'll find The House Pub, one of the best-known hidden gems in the far-west suburbs. Who's Laughing Now? The House Pub Owners Tom Wojcik and Stephen Erd. The House Pub isn't just a tap house serving a wide array of local, regional, and occasionally imported beverages. 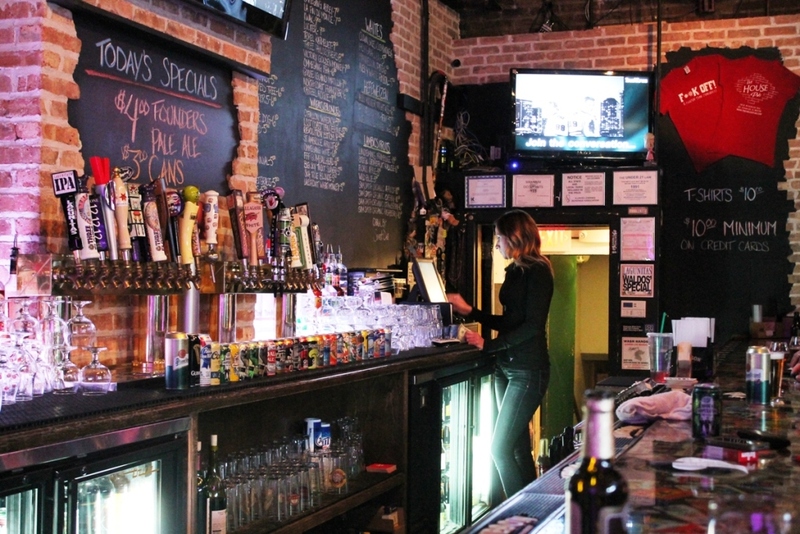 It was also the first bar in town to not only focus on craft beer, but to fully embrace it. In late 2007, owners Steve Erd and Tom Wojcik met over a game of Golden Tee at a bar across the river and decided to open a place that offered something unique to the downtown bar scene. They really settled on three things their bar had to have that others don't offer: great people, great music, and most of all, great beer. One thing that you'll notice at the House Pub is that there's no real "type" of crowd on any given night. It's a veritable melting pot of crowds and individuals. It's not abnormal to see a well-dressed, middle-aged group at one table next to a group of stoners at the next. You might see a 70-year-old retiree with a taste for stouts sitting at the bar next to a group of 20-something hipsters. And, of course, you'll find plenty of beer geeks and even staff members from some of the neighboring towns' breweries on occasion. The music you'll find at the House Pub is another point of differentiation. Steve and Tom pride themselves on having some form of live music up to six nights a week. But don't come in expecting a party band belting out Nickelback or karaoke night on the corner stage. The House Pub hand picks local acts, Chicago artists, and touring bands that bring something unique to the stage. With a high focus on blues and jazz performers, they're looking for artists with original music to share with an eclectic crowd. And with two stages, one upstairs and one down, you can normally find two very distinct vibes going on at any given time. While downstairs houses the main bar with 24 taps, brighter lights, and a generally high-energy crowd, the upstairs lounge is bathed in dim red light, plush furnishings, and a bar specializing in martinis, bourbon, and scotch, as well as over 40 different whiskeys on hand. It's a great getaway if you need a minute or two away from the crowd, or somewhere a little more romantic to sneak away for a bit. Bartenders at The House Pub don't just know what's on tap. They know what's up. And, oh, what a list it is. Scrawled in neat chalk lettering across the wall behind the bar is a list to make any beer drinker gasp when first taking it in. Divided into sections for draft, bottles, cans, and swill, and even subdivided further by style, the board is a testament to the pub's devotion to bringing a variety of beer offerings to the public. But it's a public that at one time didn't even know it wanted craft beer. Much of what the House Pub has done since opening in 2008 has involved educating the community, even other bar owners, as to what craft beer is and why they should be willing to spend more to drink less. Even though the House Pub isn't the only craft beer bar in town anymore, they see this evolution in a positive light. More places selling great beer means more educated patrons who are aware of the choices available to them. Bars down the street who wouldn't touch a keg of craft beer three years ago must have demand for it or they wouldn't be serving it. Even so, few places in the tri-cities can be considered a beer destination like the House Pub. Its focus on original musical acts, well-crafted beer, and most of all, good people having a good time keeps it at the forefront of the St. Charles craft beer scene. Check out more photos of the House Pub in the gallery. by far my favorite bar. Thanks for the poetic moment, Joel. It's definitely a great location for those of us in the far western suburbs. I actually wish I could make it in there more often.